Georgia Popoff, an independent teaching artist in central New York, has something to celebrate, a new publication. 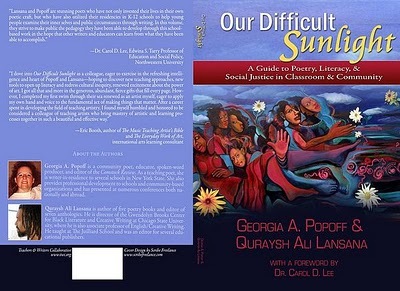 Her book, Our Difficult Sunlight: A Guide to Poetry, Literacy & Social Justice in Classroom & Community, written in collaboration with Quraysh Ali Lansana, has just been released. Georgia was a panelist in one of the WITS Alliance panels at the 2011 AWP Conference in Washington DC last week. You can read more about the book publication and launch schedule here.